Born with a facial difference, it's a rarity for me to see anyone featured on the big screen who has a similar storyline to my own – especially with a storyline that is seen in a positive light. When it comes to Hollywood, often people with facial differences are shown as villains, awkward and social outcasts, or are not shown at all. Yet, most real-life people I know with facial differences are beautiful from the inside out, changing the world one life at a time. When I picked up the book, "Wonder," I couldn't put it down. 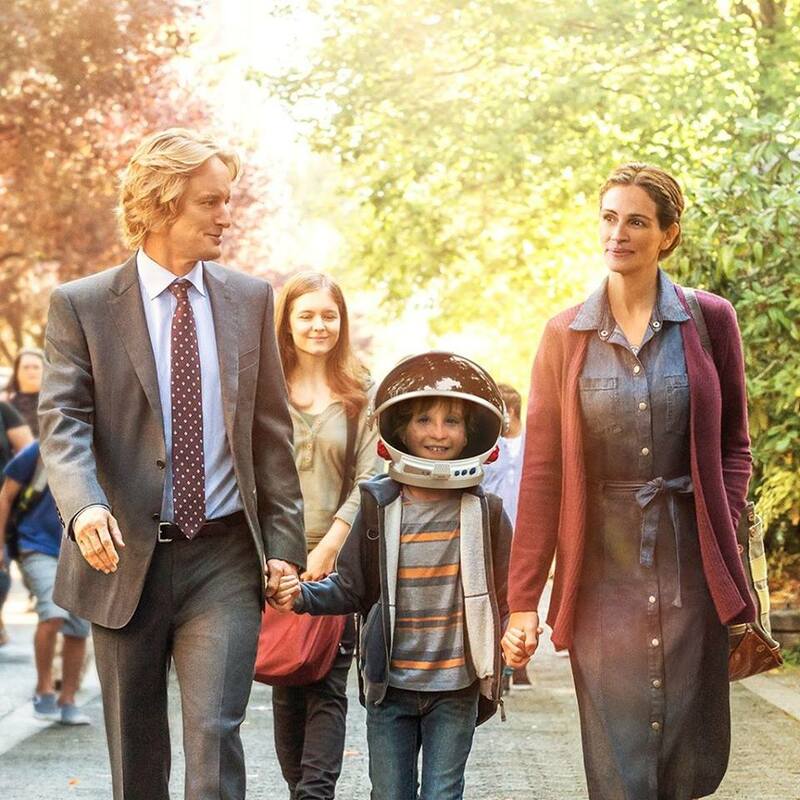 I've been excited for several movies in my lifetime, but never quite as excited as I am for "Wonder." My story may look different than Auggie's, but the basics are still the same. From medical treatments to the bullying, for the first time in my life, I'll be able to see a form of my storyline portrayed on the big screen. When I talk to people who have read the book, I've learned how their perceptions of people have changed. I've heard the stories of discussions that parents have had with their children after their nightly reading, as "Wonder" took a turn on their nightstand. I've seen the concept of kindness being refreshed in people's minds and actions. Books and words have the power to change the world – and "Wonder" has. And now it's about to hit the big screen, this Friday. I have yet to see the movie, but I can only imagine how this movie may impact the world for years to come. I can only imagine the impressionable minds that may see the movie during a family night, walking out of that theater remembering that people are people – regardless of what they look like, or don't look like – reminding to treat others with kindness for the rest of their days on this planet. Because of the work I do as a speaker and writer with a facial difference, I'm constantly in a variety of Facebook groups for people with a variety facial differences – and "Wonder" has been a big debate on some of these pages. Because the actor playing Auggie doesn't actually have a facial difference. He's a "typical" looking kid. While I do agree that it would have been preferred to have a child with the actual medical condition play the role of Auggie, I don't know what went on behind the scenes in the casting process. Did children with the condition audition? I don't know. Did the directors try to find a child who not only can play the role, but who also lives it? I don't know that either. But the actor choice won't stop me from going to see the movie. I can understand why some people may avoid the movie due to standing their ground. About 95 percent of characters with disabilities are played by able-bodied actors, and that needs to change. It's an important point to make, an important fact that needs to be changed. But I'm still going. I'm still going because I want my ticket purchase to tell Hollywood that these movies are craved, that they are needed. I want Hollywood to know that I support the fact that they've made efforts towards showing someone with a facial difference in a positive light – and not just as the bitter, angry villain with a dramatic story. I want them to know that I'm glad they're sharing his story with love and humanity, and not with the stereotype that people with facial differences are "fearful" and "scary." Photo found on the Wonder Facebook page. But more importantly? I'm still going to see the movie, in theaters, because I want everyone walking in and out of that theater to know that the story of "Wonder" isn't just a Hollywood story. It's a story that's real. I want them to know, to be reminded, that people with facial differences do exist. That they are real people...That I am a real person, sitting in the same movie theater, watching the same movie. I want them to know that facial differences go beyond the two hours of a story they just saw on the screen. As I go to to the theaters to see the movie, I hope that anyone watching the 2017 production that may see me, will realize they can start practicing kindness in that moment. They can start practicing kindness by not staring at me. By not asking with a rude tone, "What's wrong with your face?" They can show kindness by not calling me "contagious," or comparing me to a villain in their favorite superhero film. Kindness can be shown by not making assumptions about my story. I hope the audience, including myself, walks out of that theater changed. I hope that we are all reminded to always, always choose kindness – because kindness matters. I finally saw Beauty and the Beast this weekend. While in recent years I've become an advocate of how villains are portrayed in movies, the 1991 cartoon version of this movie has been a constant favorite in my life. I don't remember the first time I saw the movie, but I was young. I loved Belle's personality. She had a sense of adventure, daring to be herself - regardless of what the townspeople said about her. Oh, and she loved her books. While they never showed her as a writer, I often pretended in my childhood that she enjoyed holding a pen to a piece of paper as much as I did. But, as a child with a facial difference, my reason for loving this movie was so much more than relating to the beautiful Disney princess. 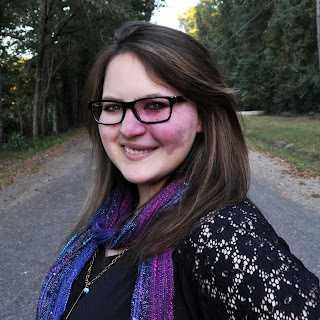 You see, I was born with a purple port wine stain birthmark that covers half my face. Three in 1,000 have my condition, but as a child, I didn't know anyone else with a facial difference - let alone anyone with the same condition. 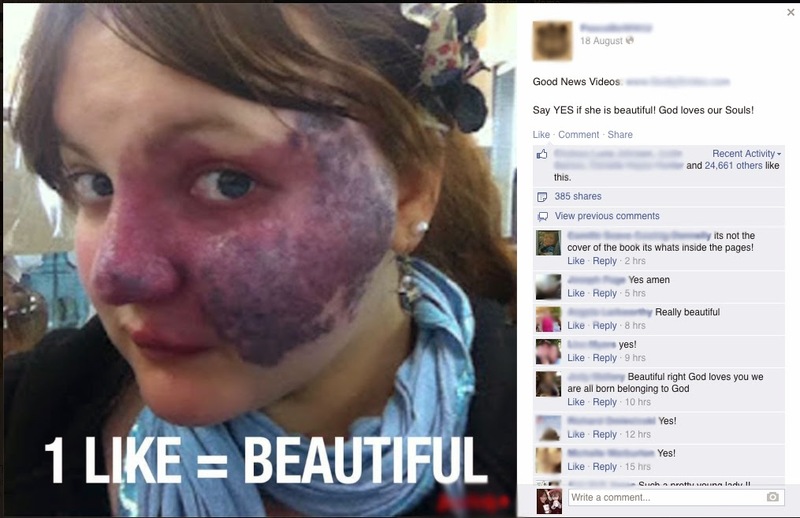 Facebook support groups for people with birthmarks weren't a thing, and we still had dial-up. Watching the movie's story-line unfold in front of me, I was in awe...Especially when Belle fell in love with the Beast. Often, as a child, I would forget about my birthmark. Unless someone made a comment, stared, or I had a medical treatment, it wasn't the focus on my life. I was just a kid. I was just like everyone else. I was focused on hanging out with my cousin, watching "Boy Meets World," and building things with my Legos. But, in that moment where Belle started to develop feelings for the Beast, I remembered my birthmark. I remembered my unique physical appearance. "People who look 'different,' can find love too. Maybe someone will one day fall in love with me," I remember myself thinking. At around 6 years old, I don't recall ever worrying about dating or finding love. I don't recall ever wondering if I would ever marry, or if anyone of the opposite gender would ever be able to see past my face's two-shaded skin tone. But as I watched Belle and the Beast fall in love, the thought of love was planted in my mind, and it would never leave. I'm now 25 and still very much single. 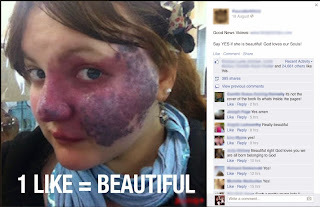 "Beauty and the Beast" still remains my favorite Disney film, but now we have high-speed internet, and Facebook groups for a variety of topics - including some for people with birthmarks like my own. Discovering these social media groups for the first time, around the age of 21, I never realized how much I craved to connect with other people with the same condition. I made new friends with similar appearances, with similar stories. Then, one day, the question emerged from my mind, "How many people who look like me have found love? How many are married, or are dating?" I then found myself shamelessly clicking from profile to profile, curious on their marital status. My 21 years old, single self needed to know it was possible. I needed to know that the concept of "Beauty and the Beast" wasn't just a Hollywood story-line. Last night, I asked my mom, "I know it was a different time with different resources when I was born, but did you ever consider trying to find someone with the same birthmark for me to connect with?" She told me that she never thought to ask, as that seemed to be the farthest thing from the doctor's minds. 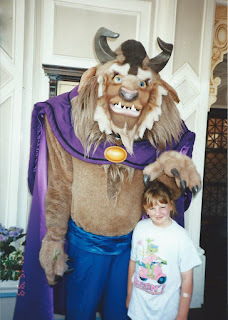 And for the first time, I told her about why I truly loved "Beauty and the Beast." I told her, "Growing up, I saw many married couples. But all those couples had typical appearances, none of them looked like me. 'Beauty and the Beast' was the first time I realized that people like myself could find love too." As an adult, I see the even deeper connections I feel with the Beast. Like the Beast, society has a hard time seeing past the appearance. Like the Beast, rumors about my appearance travel. Like him, I'm often misunderstood and mistreated - all because of how I look. And also, his name. He's literally known as "the Beast." While several know me by name, as Crystal, strangers often refer to me by my appearance. And even some friends, who have known me my whole life, my name still doesn't go beyond the phrase of, "The girl who has something wrong with her face." In a season and society of high expectations where where I've been asked to be on a show called Too Ugly For Love, Body Fixers, The Undateables, and where I've been called "contagious," and "ugly," by blunt strangers....Beauty and the Beast gives me hope. One day, it's possible that I may meet someone who won't "shudder" when they touch "my paw." He may even love both me, and my birthmark - maybe just as much as I do. 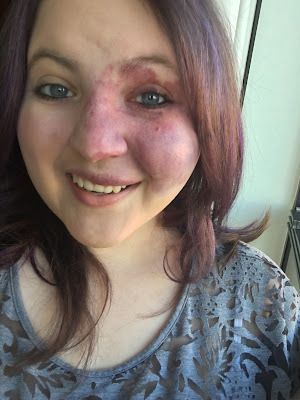 To one man, one day, I may be known as so much more than "the girl who has something wrong with her face." Side note: As an adult, thinking about the movie through my advocate-tented-glasses, beyond my personal, childhood, experience, there are many other issues I could cover. 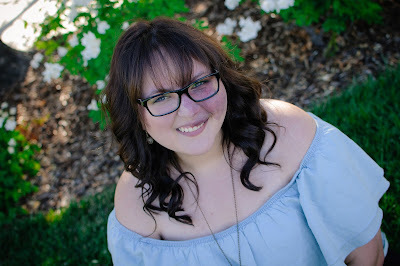 But, if you'd like to read about those, feel free to check out this article by my friend, Carly. A sweet gal from the Ukraine wrote to me today and shared that she has the same type of birthmark that I have. Reading her words, she told me, "I am afraid to leave the house without cosmetics. How do you live without cosmetics? I'm afraid people will laugh at me and don't want to communicate with me." I read messages like this on a weekly basis, and my heart breaks...Every. Single. Time. My heart breaks, because I get it. I've been in her shoes...Afraid others will laugh, afraid of what others will say. In fact, I've been in situations where people have done just that. I've had to tell people to stop staring at me, and they've laughed as they continue their forever-long, awkward gaze. A woman working at a well-known department store once refused to talk to me the whole time I sat in her cosmetics chair, as she put makeup on my face...Once I sat in her chair, she instantly switched gears and chose to only speak to to my mom. Sitting in her chair, she began to only see me as a birthmark, forgetting to see me as a person. Instead of feeling beautiful after my makeover, I left our session with a broken heart and my confidence feeling depleted. People have told me I must be contagious, and they've even cursed in reaction to my face. In addition, my image was once stolen, commented on by thousands of strangers writing their unkind words and opinions next to my unknown face, on the unexpected, popular Facebook post. My heart breaks that this has to even be an issue in society - regardless of the country and culture people are born into. In my journey, I've learned a lot. When I went viral to over 30 million people, and endured some intense cyberbullying, I questioned many things. 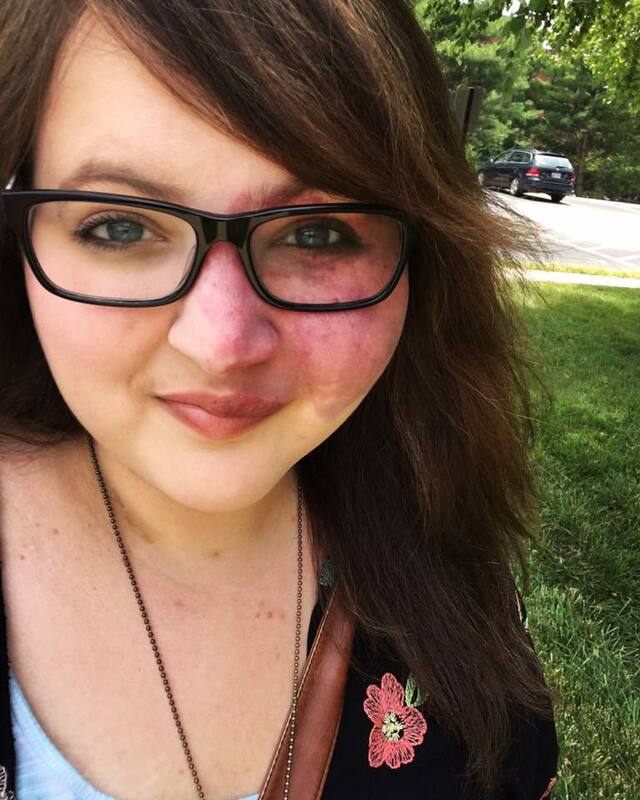 I remember asking myself, "Am I making life more difficult by not covering my birthmark? Should I be investing in the expensive, uncomfortable makeup, made for conditions like mine?" It took a while, and with the help of my family and friends, I finally came to an important "ah-ha" moment. 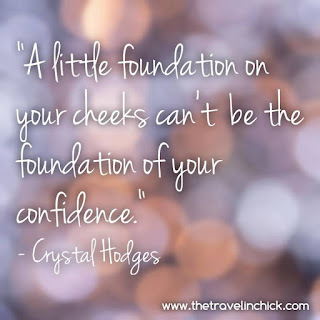 A little foundation on my cheeks can't be the foundation of my confidence. That is not where my identity lies. I mean, don't get me wrong. I like makeup. It's artsy and I think it's quite fun. Plenty of makeup brands sit in my own cabnent. But, I've always been taught that makeup is meant to enhance our natural beauty - not to hide it. I am so much more than my birthmark on my face, and honestly - I think it's beautiful. Some have told me that it reminds them of a heart. Others have told me they love the ombre affect, and all the colors mixed within it. I think it's beautiful, and hope the whole world sees it the same way one day. And most of all? I've learned that with every cruel person, there are at least two or more people who are kind. People who are encouraging me on my journey, who see beyond my obvious difference. Maybe you're in the same situation as the gal who messaged me - and maybe you don't even have a birthmark like ours. Maybe you've struggled with accepting your natural appearance, afraid to leave the house without a few layers of makeup on your face. I've heard from a lot of people over the last few years, and I know she's not the only one who struggles with the same topic. Better yet, I know I'm not the only one who has struggled with the topic. Overtime, I've heard from woman who have been put in makeup at the age of two (yes - you read that right), and from women who's husbands have forced them to wear makeup to bed. Ladies, I'm sorry that society has told us that we aren't acceptable to go out into the world just as we are. I'm sorry that others have twisted the concept of beauty, turning it into a competitive sport, rather than treating us as a one-of-a-kind, priceless gems that we are. I'm sorry there is an industry that has made millions off of our insecurities. I apologize that it hasn't been reinforced enough that we can see the beauty in others, without tearing ourselves down in the process. I wish we weren't handed a box on the day we are born, one full of society's unrealistic expectations...One that we feel we have to tightly squeeze into for the rest of our lives. You're right. Others are beautiful...But can I tell you a secret? Just because we see the beauty in other people, that doesn't make our beauty any less. You are a rockstar in the skin you're in. ...And I hope you never forget that. Did you know that Whole Foods Market sells vegan, gluten free makeup? Yeah, I didn't either. And actually, I didn't even know vegan and gluten free makeup was even a thing...Not until recently. Since learning about this type of makeup, I've had people laugh it off while asking, "Why would they make makeup gluten and vegan free?" When I learned of it, I didn't laugh it off, but was confused as well. But then my friend told me why it was important to gals like herself. My new friend has celiac disease. Her conditions prevents her from eating anything gluten related, or even being touched by it. Her whole body reacts, from her digestive system to her skin. She was telling me about a time when her sister, who doesn't have celiac disease, was spraying her hair with a new hairspray. Shortly after, my friend and her mom (who also has celiac) were both having reactions on their skin. Turns out, the hairspray had wheat in it - and it travelled through their house's vents, sharing the fumes with everyone within it. Speaking at an event at Whole Foods, I had the privilege of testing out some of their makeup before the event. Now, while I taught about topics like beauty on my blog - I am far from being a makeup guru or blogger. My review will come from the mindset of a gal with limited makeup knowledge, who still wears the same makeup her best friend told her to buy when she was standing in an aisle at Target at 17, buying makeup for the very first time...totally clueless. 1. Mineral Fusion foundation: Wowzers. This felt great on my skin. I've tried brands that leave my skin feel like they are suffocating. But this? It felt like, and instantly felt more on the natural side. Because of my birthmark, I do have to watch out for sun exposure, so I did ask if the foundation had any sunscreen in the ingredients. The sweet gal at Whole Foods told me that it didn't, but that the minerals used would help protect my skin in a more natural way. 3. Mineral Fusion blush: Oh, what a great color! I loved the way this looked, and was pleased with this product. 4. 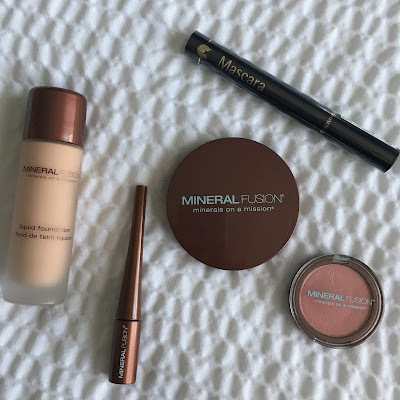 Mineral Fusion eyeliner: LOVED this. This was the first time I've ever tried a liquid eyeliner, but I was in-love with it by the first stroke. Granted, I still need a lot of practice using liquid versus what I'm accustomed to, but if I can get the hang of it - I will totally be buying a liquid form again. 5. Mascara: I liked the mascara. Pro? It looks a lot cleaner than the kind I've used from Target. Less clumps, less mess. Con? I couldn't get it to pop as much I would prefer. It came off onto my lashes on the light side. Here I am, wearing the new makeup. All-in-all, I like how the makeup feels and looks. I also love the concept of wearing all-natural products. All the products were great and I was super impressed. The only two that lacked in some way were the mascara and powder. Had the powder had an applicator? I'm confident it would hit the highest rating. I know many of you have skin conditions, like I have my port wine stain birthmark, so I did inquire about the products for those of you looking to coverup. I very seldom choose to cover my birthmark, and meant to at least try before putting this up. 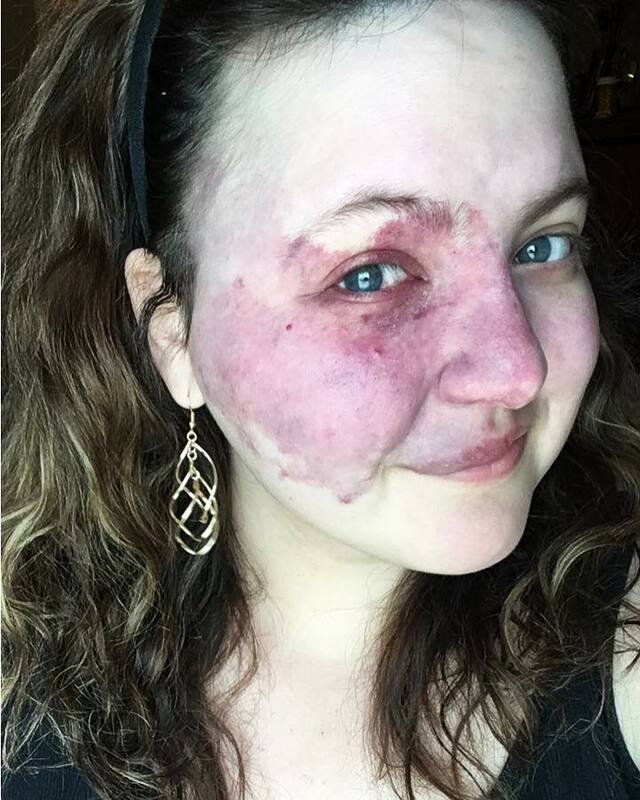 However, the lady who helped me pick out my products told me that the intent of this makeup is not to completely hide skin conditions such as my vascular birthmark. She predicted that it would not achieve that goal, if that was what I wanted to do. She still recommended using Merle Norman, Derma Blend, or other like products if that it the purpose of its use. Just like last year, I want YOU to be my Valentine. 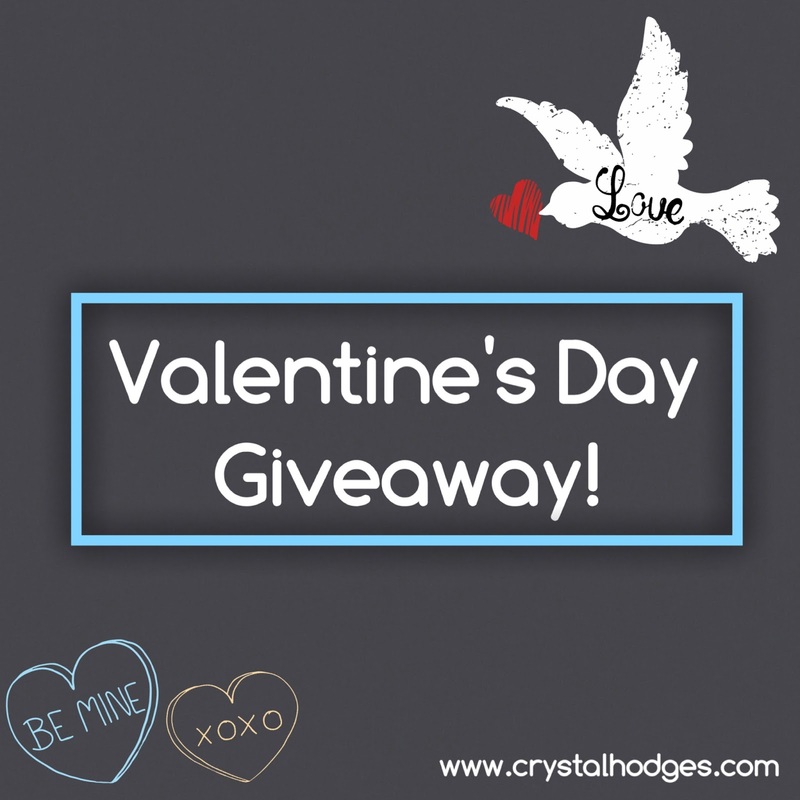 You might be wondering, "How can I be your Valentine??" Fair question. Share this blog post with your friends. On February 10th, 2017 (at 5 pm California time), I'll pick two people. 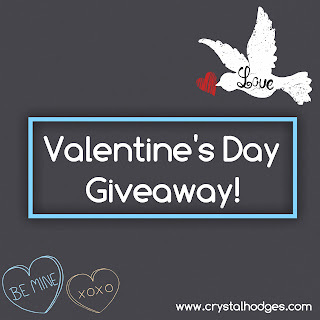 Once I pick the two people, I'll announce their names on my Facebook page and I will then private message those selected, requesting their address. This is one way of thanking you for playing such a huge part in my journey. You've spent your time reading my blog, encouraging, and supporting me. This is the least I can do to thank you for being one of my 'people'. Okay...So, what are 14 of my favorite things from the last 12 months? Thanks again for being such great friends and for reading my blog. I'm thankful for you, and I can't wait to celebrate Valentine's Day with you. It's no secret that I'm a big dreamer...A "God-sized dreamer". One of my many God-sized dreams was to share my story with K-LOVE Radio...And today that dream became a God-sized reality. 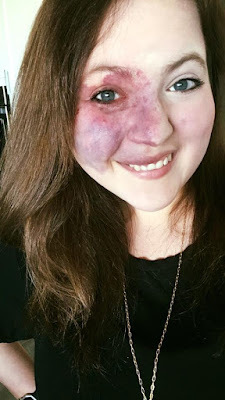 When I first became a meme and went viral to over 30 million people - all because of my physical difference (a port wine stain birthmark - and Sturge-Weber Syndrome), I struggled; and I'm sure reading over 30,000 comments from total strangers probably didn't help much. Pain overwhelmed my heart, and I had some incredibly dark days. Many days I knew God would create something beautiful from the ugly situation I found myself in. But there were days where I could only focus on the cracks that temporarily shattered my heart. Although my heart has done a lot of healing, I still vividly remember the initial struggle. I remember the pain, I remember how my journey took a drastic change two years ago. Every time God takes one of my dreams and turns it into reality, I can't help but feel all the emotions...especially the sense of being overwhelmed with his love and purpose for my life. The Japanese culture has a special tradition when certain things break...and while many may think this is a stretch - I feel God's response to our broken hearts is similar to their tradition. When items break in Japan, "instead of tossing these pieces in the trash, some craftsmen practice the 500-year-old art of kintsugi, or 'golden joinery', which is a method of restoring a broken piece with a lacquer that is mixed with gold, silver, or platinum." They do this to celebrate that items history, its story, its worth. Even though it breaks, they still see it's value, adding even more value to the cracks with gold or silver - while most cultures have a tendency to just throw the broken things out. But I feel God reacts in a similar way to our brokenness, if we stay willing and allow him to do so. He recognizes the beauty in our brokenness, and He honors it. While our brokenness and cracks often make us feel worthless and damaged, he can fill in our gaps with a valuable, irreplaceable, beauty - like the Japanese do with the broken items and gold. We feel like our value is gone, but God's saying, "just you wait and see." 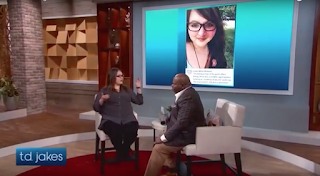 Being cyberbullied and mocked for my appearance was shattering. Yet, there's no way I could have ever imagined all that He had planned for the two years to follow: having a key group of friends surround me and lift me back up, sharing the stage with Natalie Grant, interviewing with K-LOVE, going on the TD Jakes Show (which aired on OWN: Oprah Winfery Network), being interviewed by People Magazine, amongst many other things? Wow...What beauty. If you're reading this and find yourself in dark times, fumbling around to find a light switch - know that I am praying for you. I pray you'll hold on tight, and stay willing and ready for God to use you and your story - as He fills your cracks and brokenness with golds and silvers. It's always been my goal to "make a difference with my difference" - and I'm so thankful for the opportunity to do so with K-LOVE. Thank you, K-LOVE, for the opportunity, and for creating some beauty with my on-going story.